An air of mystery pervades this wintry forest landscape. 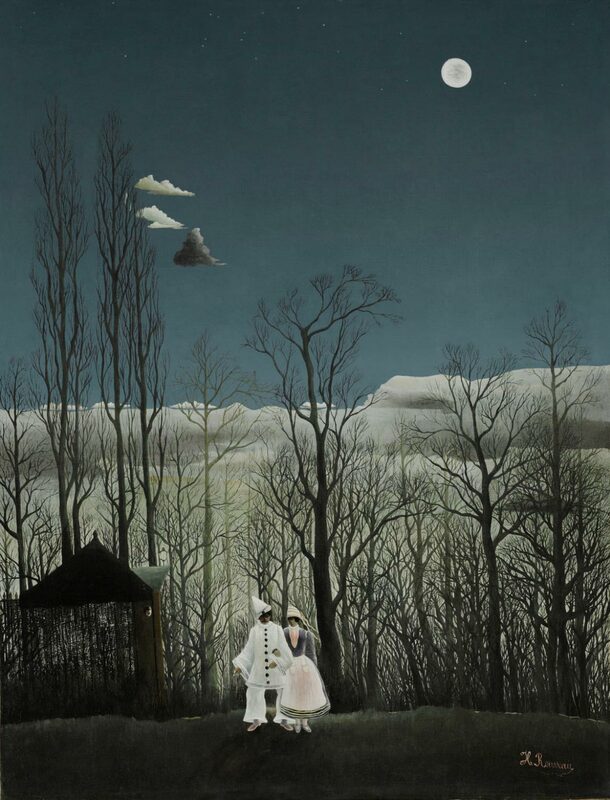 Dressed in festive carnival costumes, a lone couple stands in front of barren trees. The figures seem to shine from within rather than from the light of the moon, which has strangely left the forest in darkness. An unexplained face leers out from the empty hut beside the figures, and an unexpected street lamp incongruously glows nearby. Known for his fantastic scenes, Rousseau was a self-taught artist whose works appealed to the collectors and avant-garde artists of the early twentieth century, including Pablo Picasso. First shown in the second Salon des Indépendants in Paris in 1886, this painting is an early demonstration of Henri Rousseau's unique chromatic imagination, his proto-Surrealist ability to juggle unexpected pictorial elements, and his untutored but brilliant skill in the stylization of forms. An officer in the French customs service, Rousseau scoured picture books of adventures in exotic locales in search of pictorial motifs. He combined these disparate elements in compelling images that early in the twentieth century attracted the devotion of vanguard artists such as Pablo Picasso. Here Rousseau locates mute, unmoving figures in carnival costume against a calligraphic backdrop of bare black tree trunks and branches. The dwindling light of dusk that filters down through the trees and the crisp winter chill, vividly evoked, both carry a hint of menace. Isolated and vulnerable in their fantasy clothing, the two figures confront the viewer bravely and with naïve conviction, like characters waiting for Samuel Beckett to write them a play. Christopher Riopelle, from Philadelphia Museum of Art: Handbook of the Collections (1995), p. 202. Mrs. Renée Fantauzzo, Montrouge, Hauts-de-Seine (nr. Paris), France; Michel and Rose Kikoïne, Montrouge, France, 1933? ; consortium consisting of Louis Ritman (Chicago), Michael Brenner (Paris), and Michel and Rose Kikoïne, by 1933 ; sold to Louis E. Stern, New York, June 1934 ; bequest to PMA, 1963. 1. Henry Certigny's catalogue raisonné, Le Douanier Rousseau en Son Temps (vol.1, p. 32), states that the painting was rediscovered in Montrouge between 1929 and 1934 by Michel Kikoïne, at the home of the elderly nurse of his aunt. According to a statement by Michel and Rose Kikoïne, the painting was acquired by them from Mrs. Renée Fantauzzo of Montrouge (the nurse?). In a letter to Gordon Washburn of the Carnegie Institute, Pittsburgh (to which Stern lent the painting for a 1951 exhibition), Stern states that "the whereabouts of this picture were unknown until it made its appearance in 1933 .... It wasn't until the last member of the previous owner's family died, that the painting could be sold. I have never been able to learn with any degree of certainty, the name of this family." A statement by Michael Brenner provides an authentication of the painting, and states that Louis Ritman brought the painting to the U.S. from Paris in September 1933. Bernard Pincus, executor of Stern's estate (letter to PMA curator Henry Gardiner of August 6, 1964) says that Ritman represented a small group of artists who had purchased the painting from a French dealer (?) on speculation. As well as being a friend of Kikoïne, Ritman was a friend of the Sterns, having painted a portrait of Mrs. Stern, the former Irene Hudson (see Henry Gardiner, Stern Collection, introduction). In December 1933, Ritman had given Irene (Hudson) Stern, director of Milch Galleries, New York, an option to sell the painting (copies of all of the above documents in curatorial file; originals in PMA Archives, Modern/Contemporary "Historical Files", Stern collection). Brenner (1885-1969) was a sculptor and co-owner of the Washington Square Gallery in New York, for which he acted as European agent (see Smithsonian Institution, Archives of American Art, Michael Brenner papers). 2. Copy of dated memorandum of agreement of sale in curatorial file.